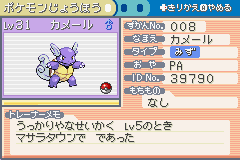 The first screen shows basic info such as; Number, Name, Type, Original Trainer, ID, Nature, and where it was caught. 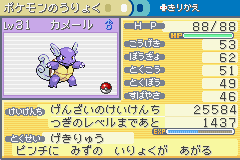 The second screen shows the Stats, Experience, and Ability of the Pokemon. The third screen shows the attacks of the Pokemon. You can go into further detail of the attacks much like Ruby and Sapphire.